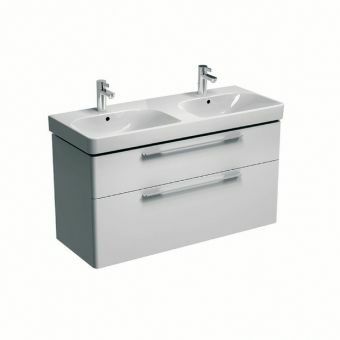 Geberit Smyle Vanity Unit with 2 DrawersFrom £274.93 inc.VATRRP: £366.58 (Save 25%)600, 750, 900 and 1200mm widths. White or light grey colour options. Free DeliveryGeberit iCon 45cm Side Cabinet with Two DrawersFrom £424.61 inc.VATRRP: £566.15 (Save 25%)45cm wide side cabinet, can be used on its own or in combination with the rest of the iCon range. 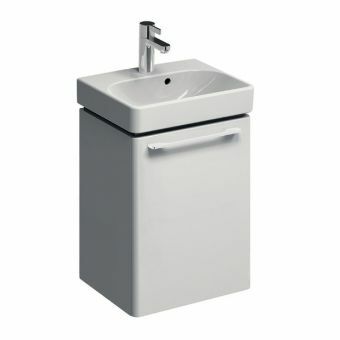 Geberit Smyle 45cm Vanity Unit & BasinFrom £147.91 inc.VATRRP: £197.21 (Save 25%)Compact vanity unit and basin with useful storage area, clean gloss white or contemporary light grey finishes. Geberit Smyle Tall CabinetFrom £323.59 inc.VATRRP: £431.45 (Save 25%)Wall hung tall cabinet with a useful mirror on the inside of door, 1800mm tall, 36cm wide. 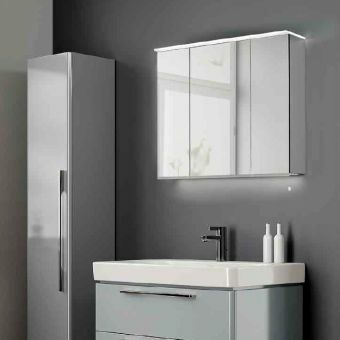 Free DeliveryGeberit Icon Two Drawer Cabinet for Two 50cm WashbasinsFrom £482.70 inc.VATRRP: £643.60 (Save 25%)Couples double vanity unit, perfect for your new master ensuite! Available in White, Natural oak, Lava finishes. Whether you have a family bathroom or a luxury ensuite, good storage is paramount to deliver the uncluttered and streamlined look we all aspire to. 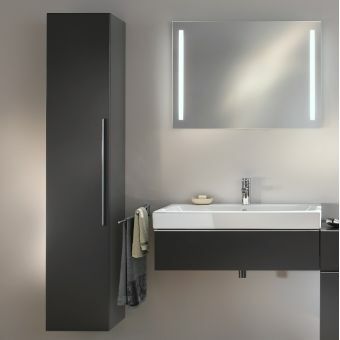 We understand that when you create your ultimate bathroom, you want a range of vanity and other storage units. 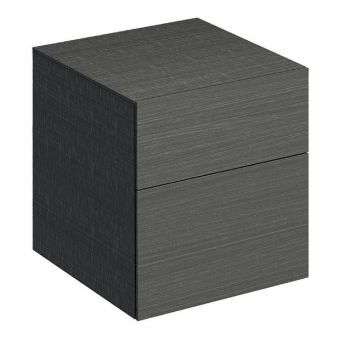 These will store toiletries and towels so you can enjoy clean and contemporary lines in your sanctuary space. 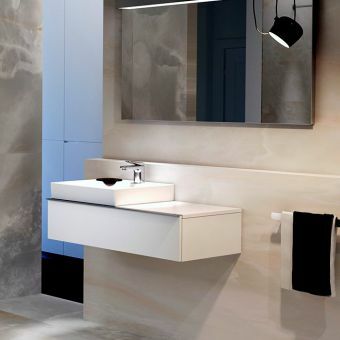 Choose products from our five Geberit ranges and you’ll enjoy high end finishes and design details that create that perfect modern bathroom, whatever your style. 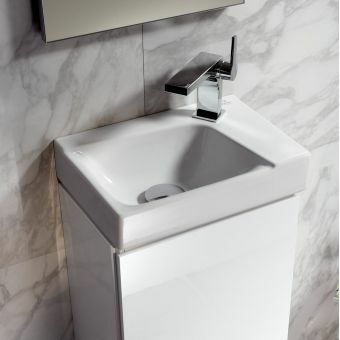 These cabinets and vanity units are created to integrate seamlessly with ceramics from the Citterio, Xeno2, Acanto, iCon and Smyle ranges to create a wide range of looks depending on the size of basin you choose, be that a compact handrinse basin for a cloakroom or a show stopping double sink unit. Complement these pieces with a tall unit or side units, and shelves to create additional, stylish storage space for a fully integrated look. 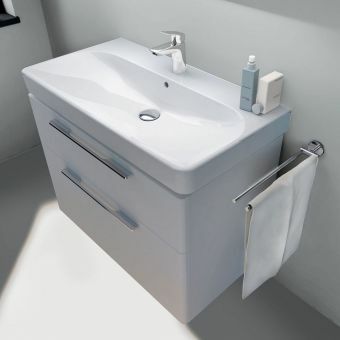 Geberit bathroom furniture features clean lines and elegant finishes designed not only to look good with your ceramics, but to transform your bathroom into the harmonious sanctuary of your dreams. 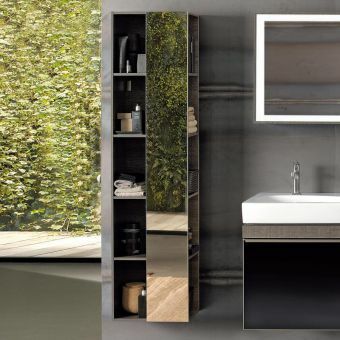 The flexibility and modular design of these cabinets means they will suit any bathroom layout and the use of robust and high-quality materials and moisture resistant materials makes these pieces extremely durable. 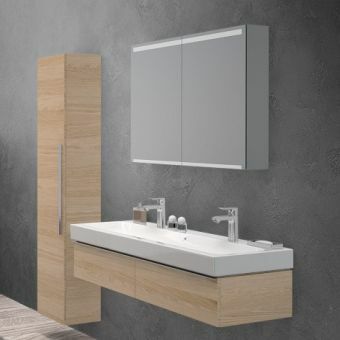 By using wood based panels that have been specifically designed for the high humidity environment of your bathroom, Geberit create long-lasting and beautiful furniture that stands the test of time. 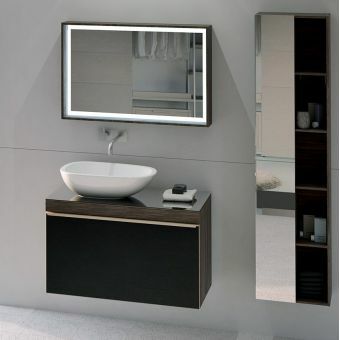 With a range of clever design elements, including touch to open drawers, clever compartments and lighting, these vanity units are not just supremely functional but also perfectly designed to be aesthetically pleasing. 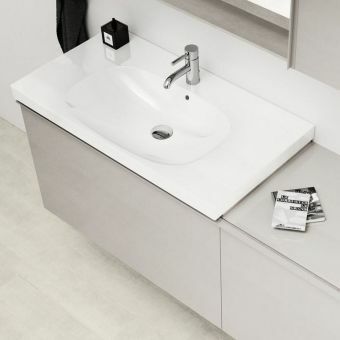 Geberit’s bathroom cabinets feature the same uncompromising commitment to quality as demonstrated in their bathroom ceramics. Selecting the right storage solutions for your new bathroom can dramatically impact on its overall look and functionality. 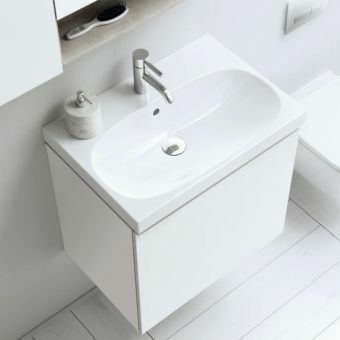 You could select your ceramics first, but if the look and feel of your vanity unit and cabinets is important then we’re sure you’ll find your ideal Geberit range, allowing you to optimise your room design and achieve the tailor made finish that suits your style. Across the five Geberit ranges, you’ll experience the design and attention to detail that will help you achieve your bespoke bathroom design, even in the smallest spaces with compact vanity units for the luxury cloakroom that doesn’t compromise on style. Choose the purity of line of the Citterio collection and you’ll experience the best of Italian design in your bathroom. This premium range, from the imagination of premier Italian architect and designer Antonio Citterio, blends originality with quality to create a bathroom that is timelessly elegant and a real sanctuary. Xeno2 was created by renowned designer Robin Platt and is perfect for lovers of modern and minimal design. Clean geometric shapes in a range of complementary finishes are designed to create a modular and utilitarian functionality that doesn’t compromise on impact. This range offers perfect coordination of intelligent and well thought out components for a streamlined look. 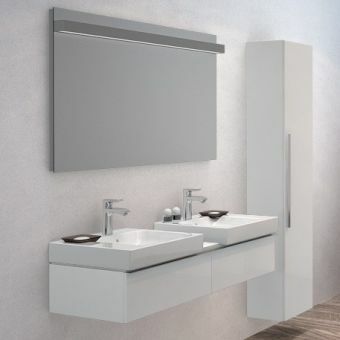 Chic and smart, the Acanto range is flexible and diverse, pairing basins in a wide range of sizes and configurations with vanity units and cabinets that blend glass and wood, metal and painted finishes, allowing you to create the ideal bespoke look for your family bathroom. 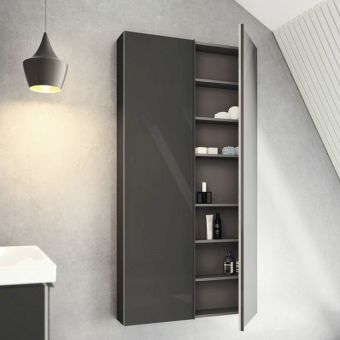 With a focus on ergonomics to suit every member of the family, and clever compartments or drawers designed to keep everything within easy reach, Acanto bathroom furniture is the ideal solution. 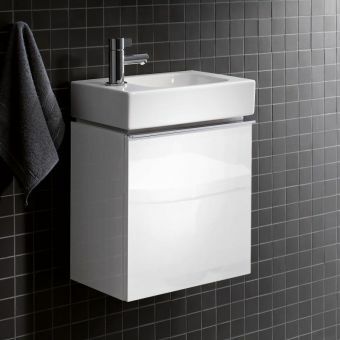 Geberit’s iCon range is the definition of cool, smart and modern. 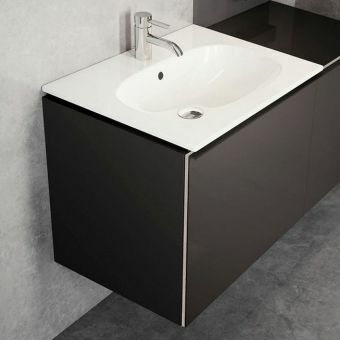 This bathroom furniture has clean modern shapes with light reflecting finishes. The iCon range will optimise your design, creating the illusion of space. 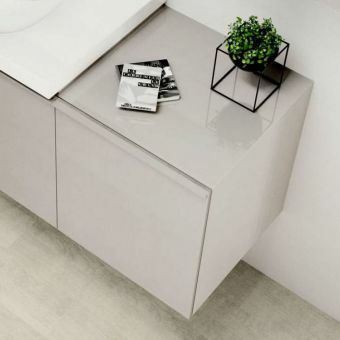 Pieces from this range are also perfectly adapted for small or awkward spaces, helping you to create a beautiful cloakroom or smaller ensuite without compromising on the quality of the design. 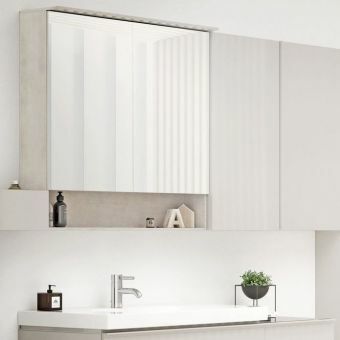 The Smyle range of vanity units and cabinets bring a sense of relaxed harmony to your family bathroom, with generously sized cabinets and vanity units creating valuable storage and an efficient use of space. 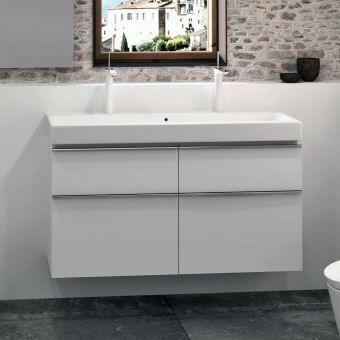 With beautiful detailing in the handles and features like soft closing drawers, these high gloss white or pale grey pieces are ideal for creating a very contemporary bathroom. 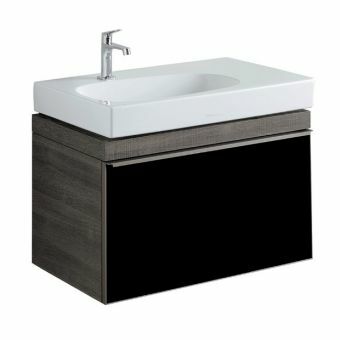 A vanity unit is one of the hardest working pieces in your bathroom. 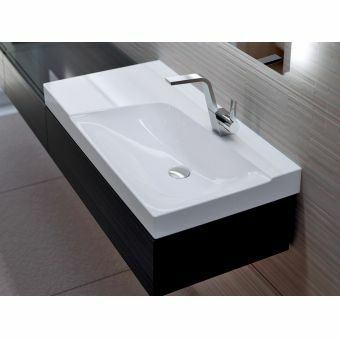 It needs to be streamlined and clutter free, and has to support an inset or counter top basin, while looking smart and chic in its own right. 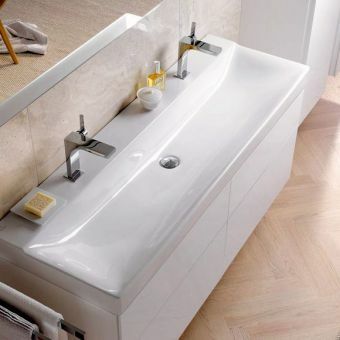 Bathroom furniture is at the heart of what we want from our bathrooms: a space that is calm, clean and functional where we can relax and unwind from the rigours of the day. 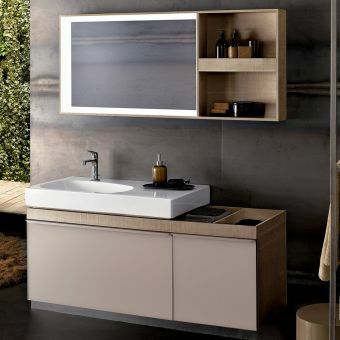 As much a sanctuary or spa as somewhere to take a bath and get clean, the modern bathroom is minimal and low maintenance, and a vanity unit is central to achieving that look. There’s no wonder that high end hotels invest in luxe vanity units, that both conceal toiletries and other products and are easy to keep clean and looking their best. 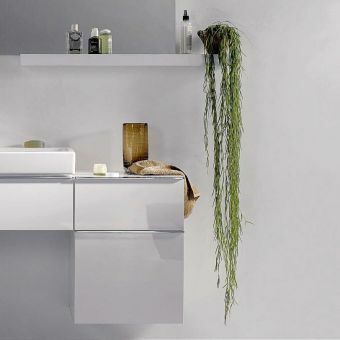 For a truly show stopping piece, the Geberit Citterio cabinet for lay-on washbasin, with two drawers and shelf surface, will make a real design statement in your bathroom. 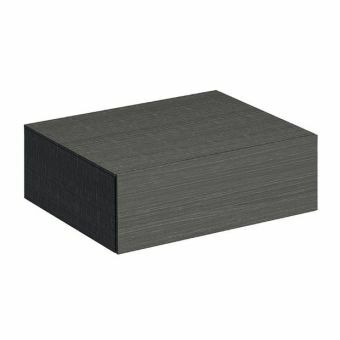 Its wood and glass finish is available in either champagne and blonde wood for a Scandi vibe, or dramatic dark wood and dark smoked glass for a more intense effect. With two drawers and concealed handles, this piece features a glass cover plate and is available either in a right or left hand configuration. 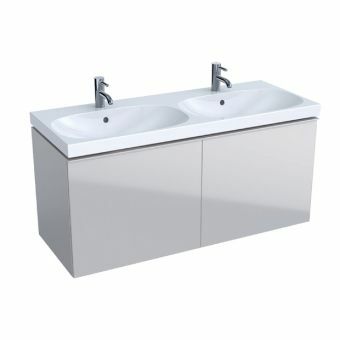 To up the drama, opt for the double basin unit either wall hung or with its optional feet. 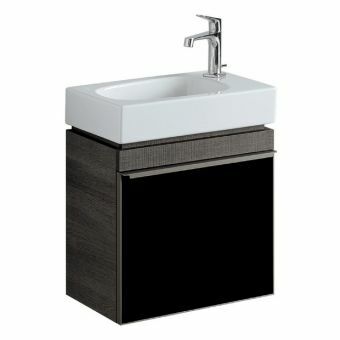 Although effortlessly modern, this vanity unit could also add a contemporary twist to an Art Deco scheme. 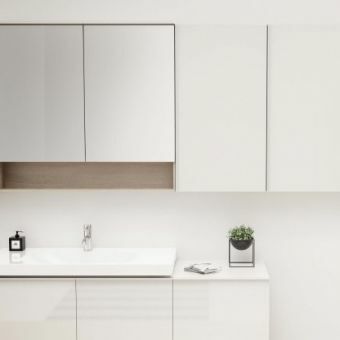 Alternatively, create a truly minimalist finish with vanity units from the Xeno2 range with their push to open mechanism for ease of use and a completely streamlined look. 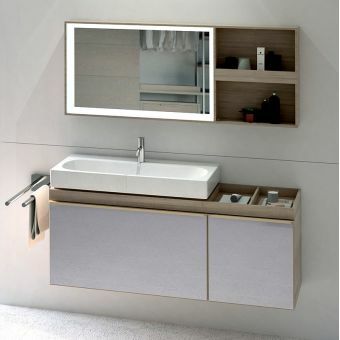 With a glass cover plate to protect your unit, plus clever storage compartments and integrated LEDs to allow at a glance access to the upper drawers, the Xeno2 vanity is the perfect finishing touch for a luxury ensuite. You may not associate the modern vanity unit with a traditional bathroom, but the versatile iCon range in the oak finish would make a stylish addition to a more classic bathroom, thanks to the warmth and timeless elegance of the wood finish. Pair with a wide twin tap trough basin and you’ll create a focal point that won’t look out of place with a traditional roll-top bath. 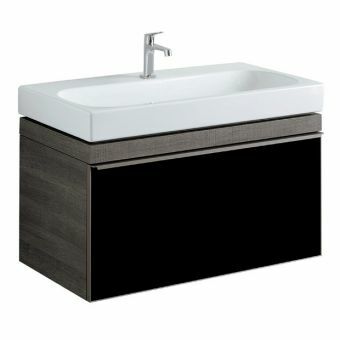 Or pair a modern freestanding bath with a high gloss white or lava grey vanity to create masses of storage space and an innovative design based around your needs. 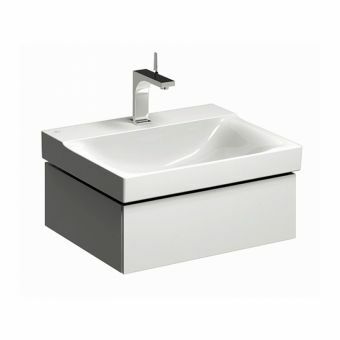 The Geberit Smyle vanity unit, which is designed like the other vanity units in the Geberit range to fit a wide range of basins from single units to trough or twin basin styles, offers a softer aesthetic, creating a relaxed and comfortable look and feel that’s suitable for either a family or guest bathroom. The light reflecting high gloss finish works to reflect light and open up the space, while the shadow gap creates an appearance of weightlessness. Coupled with the softly curved lines and the attention to detail in the soft closing drawers, the Smyle vanity unit is perfectly adapted to your needs. 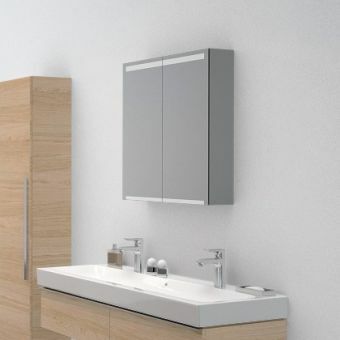 Each of the five Geberit design ranges offers a tall cabinet and additional side cabinets that not only maximise storage but allow you to play with the design of your bathroom or ensuite. Create a design solution tailor made for your requirements, whether you love to pamper yourself or you prefer to dive in and out of the bathroom. 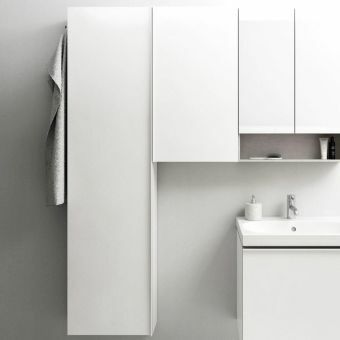 Smaller cabinets are also a clever compliment in a cloakroom or compact ensuite. The modular concept of the iCon range is perfect for maximising storage, while the low installation depths are designed to optimise even the most challenging space. Select the Smyle range and you’ll enjoy generous storage on easy to clean glass shelves and a door length mirror, plus an integral light so you can see the contents of the cabinet at a glance. Ideal for everything from toiletries to towels, a tall cabinet can add the extra storage a family needs, while a side cabinet can help you keep essential items within easy reach. For example, the iCon and Xeno2 ranges are strongly modular and lend themselves to the creation of unique and effective layouts, whether they’re symmetrical or asymmetrical. This flexibility allows you to create something really special in your bathroom. Perhaps the most adaptable of all the Geberit ranges, cabinets from the Acanto range are designed to meet all the needs of everyday life. Let your imagine and design skills run wild by combining white gloss and dark, dramatic shiny glass in lava, with the cool neutral of matt sand for a bathroom that can be as show stopping or as subtle as you like. Try pairing a lava glass fronted tall cabinet with matt sand side cabinets for the ultimate in understated glamour. 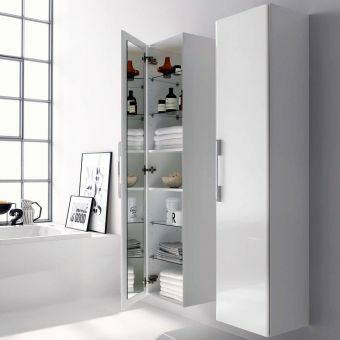 For the dream ensuite, the Citterio range offers the ultimate in chic designer storage. 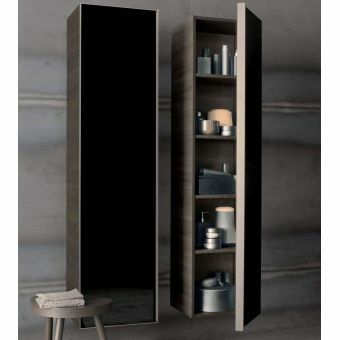 The generous wall cabinet with flexible shelved storage creates a stunning effect with its mirror finished door, whether you choose elegant taupe or glamorous black. Add a lateral shelf unit with an illuminated mirror and you’ll create a fascinating interplay of wood and glass that will perfectly offset a modern freestanding bath for a luxe boutique hotel feel.